Wilmer “Bill” C. Swartley, Jr.
Wilmer “Bill” C. Swartley, Jr. is one of the pioneers of Boston television. He launched WBZ-TV, New England’s first television station, on June 9, 1948 and served as its General Manager for 13 years. 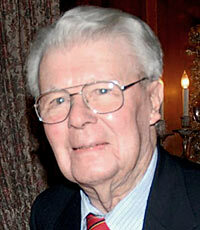 Wilmer “Bill” C. Swartley, Jr. is one of the pioneers of Boston television. He launched WBZ-TV, New England’s first television station on June 9, 1948 and served as its General Manager for 13 years. Along with the late Gordon Swan, Bill was also instrumental in the development of WBZ-FM. Promoted to Regional Vice President of Westinghouse in 1954, he remained responsible for both WBZ radio and WBZ-TV until his retirement from Westinghouse in 1961. Bill was instrumental in the formation of the Massachusetts Broadcasters Association (MBA) in 1954, which, today represents more than 200 over-the-air broadcasters in Massachusetts. He served as its first Vice President, and, after his retirement from Westinghouse, as Executive Director. A 1930 graduate of Cornell University, Swartley, joined Westinghouse in Pittsburgh in 1939, and he served as General Manager of WOWO in Ft. Wayne, Indiana, before coming to Boston to work for WBZ in 1940. Bill served in World War II, as Major in the US Army, returning to WBZ in 1946. Born on June 16, 1908, Bill is now 102 years old, which makes him our first centenarian inductee.